I've seen that Egyptian hieroglyphs are not always written or drawn identically. Is there any reference online for the evolution of the shape of hieroglyphs? 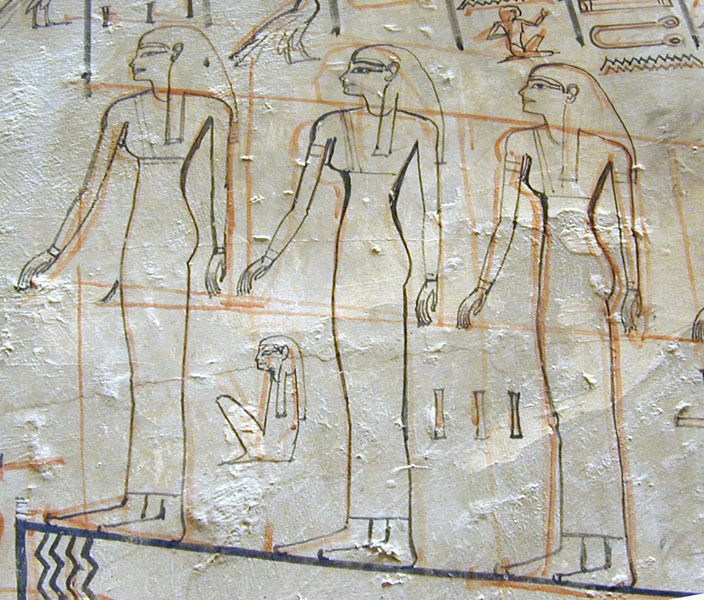 Pure hieroglyphs are complete images, usually in multiple colours. 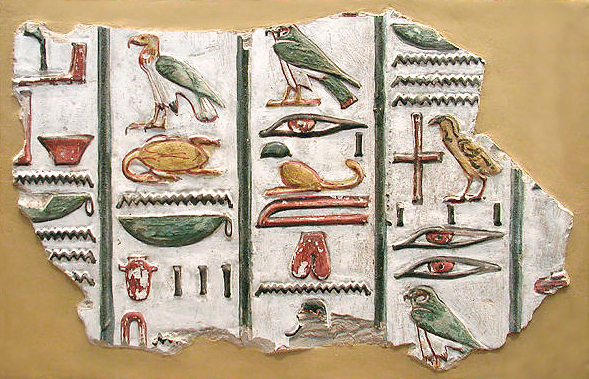 Umbratic hieroglyphs are carved into stone and intended to be filled with a coloured plaster or enamel. Profiles are likewise carved into stone, and filled with paint. Linear hieroglyphs are simply drawn, in a single colour, which I suspect is what you saw. Hieratic characters, which are no longer really pictures, but simply symbols. The Demotic characters are simplified versions of the Hieratic characters. I suspect that the linear style is what you saw. Although hieroglyphs, and indeed the Egyptian language, did change over time, the tombs in the Valley of the Kings all date to the same period. The royal tombs there were all cut in the New Kingdom, and date from about 1540 BCE to about 1075 BCE. The language spoken in Egypt at that time is what we now call Middle Egyptian. 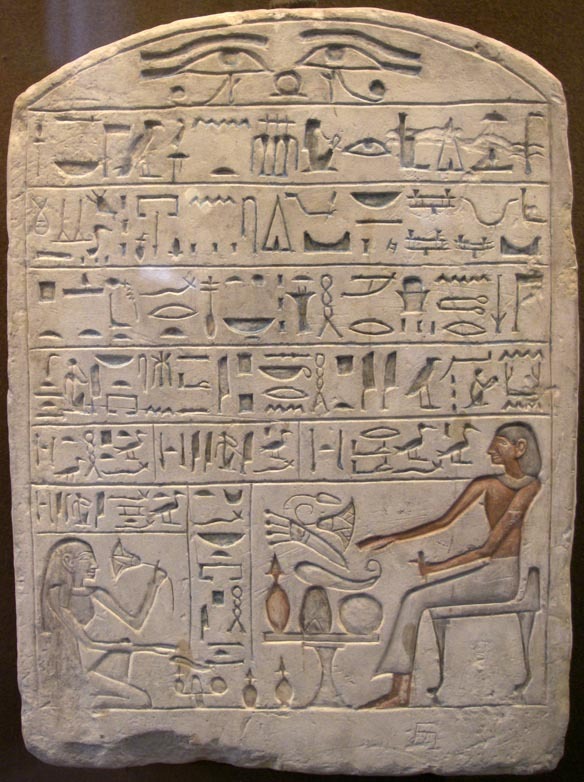 The written hieroglyphic language consisted of around 900 hieroglyphs, and there were no significant changes in the form of hieroglyphs over that period. It is important to note that there were three distinct scripts used in Ancient Egypt. 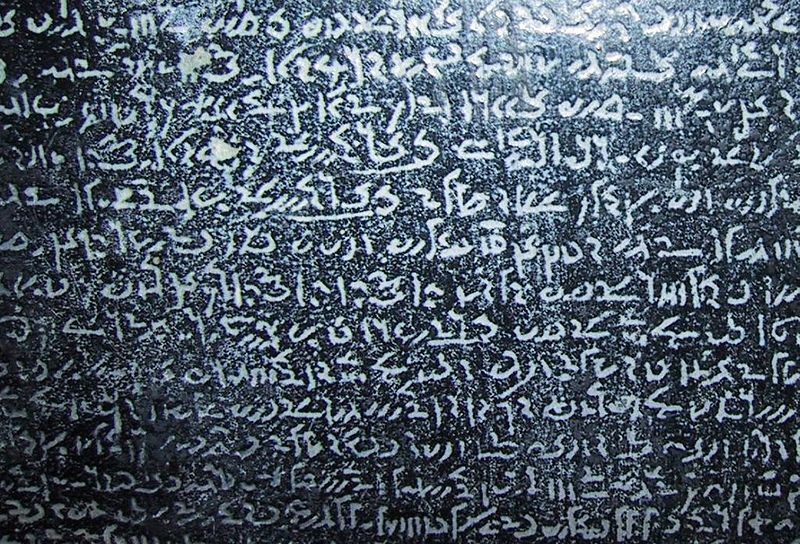 These are the most recognisable of the scripts used in Ancient Egypt. They were used primarily in tombs, on offering stelae and on monumental inscriptions. It was also one of the three scripts used to record the inscription on the Rosetta Stone (together with Ancient Greek and Egyptian demotic - see below). The number of symbols expanded significantly in the late period, and they continued to be used right up to the 4th century CE. This was the most commonly used form of the language, generally written on papyrus with reed pens. This developed from the hieratic script and was used to write in what we now call Late Egyptian. In the royal tombs in the Valley of the Kings, all the inscriptions used the hieroglyphic script. As a result of records that we have recovered from the workers village at Deir el Medina (also, see my answer to the question 'Where can I find reliable primary sources written by Ancient Egyptian laborers?' for more)), we know a great deal about how tombs were built in the Valley of the Kings. Teams of rock-cutters cut the tombs into the limestone. Teams of plasterers then coated the walls with layers of a type of plaster called muna, made from clay, quartz, limestone & crushed straw. The plaster was then covered with a thin layer of clay & limestone whitened with gypsum. Teams of draughtsmen then drew the tomb decoration and inscriptions onto the finished plaster. This was done using red ochre. The chief draughtsman would then inspect the work, and make corrections where necessary using black charcoal. Then teams of sculptors carved the bas-relief and teams of artists applied the decoration using specific colours. Of course, if the pharaoh died suddenly, the work had to be completed in a hurry (the pharaoh had to be mummified and buried according to a strict timetable). As a result, we have examples of all these stages where work had been interrupted. There are more images of KV 57 available on Osirisnet, if you are interested. For more information about the tomb of Horemheb, you might enjoy the recording of a lecture titled Haremhab, Pharaoh and Conqueror: New Investigations in His Royal Tomb in the Valley of the Kings on YouTube. Based on your description, I'd say that what you saw was probably the version painted onto the walls by the draughtsmen, before they were carved and painted. 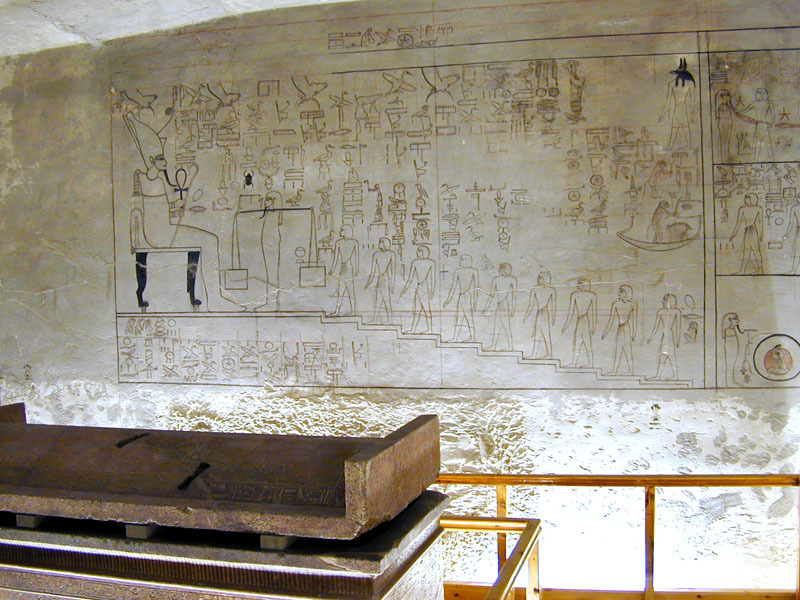 However, without knowing which tomb you actually visited, it is impossible to say for certain. Perhaps some of the images on Osirisnet (link above) will jog your memory. Not the answer you're looking for? Browse other questions tagged language ancient-egypt writing or ask your own question. Were the earliest Egyptian hieroglyphs ever discovered really found in Qustul in Ancient Nubia? Could Egyptian hieroglyphs accurately record conversational day-to-day discussion?